Time to throw that turkey in the oven and enjoy the smells of it baking along with everything else! I have ran across some cute quotes and cartoons on PINTEREST and FB that I wanted to share about Thanksgiving... I am all for this! Even when you try to eat a bit of this and a touch of that...you end up with a plate full.... course then there is deserts! LOL.....not my job! Besides on a FB topic the other day I asked about who had turkey in a pan or in the turkey.... PAN won. There again... I will not be stuffing anything but me! Saying this poem over and over again. I LOVE PINTEREST! I love to search different things to make and do, pinning them to my board in hopes that one day I will get to IT ALL! haha Here are a few Christmas things that peaked my interest. 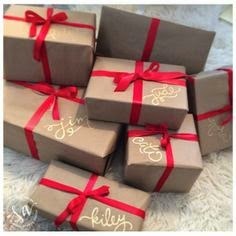 I love the idea of wrapping like this....so simple yet would be so eye catching under the tree. If you collect paint samples through the year, look at this idea. Now this is not really Christmas unless you make it for a dog lover! Yes, I can relate. Cute. You could hang in the house or even on the door. Have you recently finished off some wine? Hold onto that bottle. Adorable! I love this. I want to work on doing this maybe next year, course it would not have to be a Christmas thing, depending on the color ribbon, it could be anytime of the year. Yep, I want! Of course while scanning PINTEREST I have learned how to make these from an old sweater! I normally don't wear sweaters but Goodwill is not far down the road. This is too cute too. Another sweater idea! Saturday was a busy day, no rain and I felt good so I needed to get some things done. I have had this shelve for a couple of years. I was going to redo it for my grandson's room but never did. My daughter collects shot glasses and she has run out of space to display them. Shhhh, glad she don't read the blog cause his is part of Christmas. Same with the white shelve. Like me she is going black with things like this. The shot glass shelve finished. Also decided to throw this in so I painted it black also. This is a project I started back sometime ago and stopped! I had it painted a pretty teal blue and was gong to decorate the top and messed it up... so this was more of a fix project!! It started out to be a wooden tissue holder, once I cut a back for it and paint that, it will be sealed and hung outside as a birdhouse. This amazing woman started Homestyle Bakery in 1975. 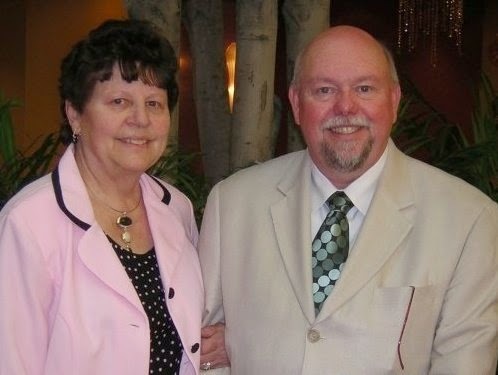 This is Beverly Edwards with her sweet hubby Mike.